Family feuds, poisonings, murders, conspiracy. Nero’s life sounds like something out of a crazy drama, but at least some of the stories told about him are likely true. The last emperor in the Julio-Claudian dynasty of Rome, he came from a family known for their corruption. 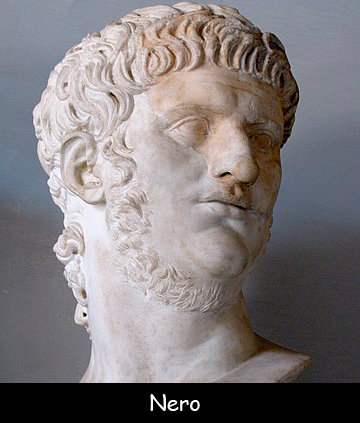 Nero was born on December 15, 37 AD. He came from a long line of Roman aristocrats and leaders. One ancient biographer, Suetonius, described Nero’s family critically. He said that Nero’s grandfather enjoyed the violent gladiator sports too much and that his father was brutal and immoral. Nero’s father died when Nero was a young child. His mother, Agrippina, was exiled for plotting against her brother, Caligula, who was emperor. Caligula was ambushed by his own men and killed. Agrippina married Claudius, the new emperor, who adopted Nero. Claudius died in 54 AD. Several ancient historians wrote that Agrippina plotted to have him poisoned. Nero became emperor. Agrippina tightly controlled Nero’s early years as a leader, making most of the political decisions. As Nero got older, he threw off Agrippina’s control and eventually had her killed. Nero was ambitious. He ordered new palaces, theaters and roads built. The people of Rome were heavily taxed to pay for his projects. He divorced his wife and exiled her. When the public protested, he accused his ex-wife of betrayal and had her executed. Some ancient historians said that Nero started the Great Fire of Rome in AD 64. The fire burned for more than a week, destroying much of the old city. Critics believed Nero started the fire because he disliked the ancient construction and wanted to make room for his Golden House. The Golden House was a huge compound with lush gardens, theaters, and dining rooms. The ceilings were painted with elaborate murals – a practice that would be seen again in European churches. One story says that over one of the dining rooms was a ceiling painted with the stars and sky. The ceiling could be rotated by a crank. At the same time, perfume was sprayed and rose petals dropped upon guests. After the fire, Nero is said to have blamed Christians for starting it. Historians recorded that many Christians were burned, tortured, or thrown to wild beasts as punishment. As the years went on, Nero’s supporters turned on him. People in several areas of Italy rebelled against him, eventually gaining the upper hand. Nero tried to flee Rome, but his soldiers refused to take him. He returned to his palace and found that his guards had left. His friends were all gone too. Word came that the Senate had voted to execute him. As the horsemen came to get Nero, he asked his private secretary to kill him. Historians recorded that many people celebrated his death. Question: What happened after Nero’s death? Answer: The huge statue Nero had had made of himself was moved and changed to be a statue of the sun god. His great palace was stripped of many of its treasures.